One of the most popular food trends at the moment is fermenting. This ancient food preparation technique offers a salty-savory flavor that compliments many different dishes. Popular worldwide, fermenting is used to make everything from cheese to bread, to sauerkraut. Kimchi, a popular fermented food, has helped to elevate Korean cuisine to the “it” food for many restaurant concepts. 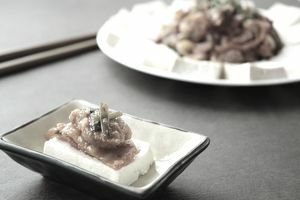 As a traditional side dish or as a unique ingredient to classic menu items, fermented foods, especially those that are house-made, offer restaurants a low-cost way to increase the value of customer’s perception. Fermenting is often classified as a way of preserving food. But strictly speaking, fermenting isn’t a preserving method in the same sense as canning or freezing. Eventually, fermented foods will spoil. From Food Lover’s Companion, “Fermentation is a process by which food or drink goes through a chemical change caused by enzymes produced from bacteria, microorganism, or yeast.” An important part of many cultural cuisines, fermenting is used to make everything from sauces to beverages to breads and pickles, offering a way to preserve fruits and vegetables beyond the local harvest season. Kimchi, one of the most popular fermented foods, dates back to the thirteenth century and comes in over 200 varieties. This popular condiment has made its way from Korean restaurants and food trucks to other Pan-American concepts. According to Rick Zambrano in his article Bubbling up Fermented Foods on the Menu and in the Grocery Aisle, “Fermented foods like Kimchi offer a salty, savory flavor that appeals to umami – the fifth taste.” Fermented foods add depth to otherwise mild flavors and ordinary ingredients. For example, some ethnically themed food trucks offer traditional hot dogs topped with kimchi instead of relish. Added to soups for a different flavor experience. The savory bold flavors of kimchi follow the current trend of Asian inspired condiments like wasabi and sriracha. Embracing new flavors like Kimchi is a natural progression in American dining habits. Where once teriyaki sauce, salsa or more recently chipotle, have been the darling of the food scene, now is the time for fermented flavors. According to the National Restaurant Association’s 2015 Culinary Forecast, fermenting was rated as a hot trend by 57% of chefs polled. One major reason for the popularity of fermented foods is the willingness of consumers to try new foods. The biggest food trend at the moment is a renewed interest in local, handcrafted foods. Fermented foods, especially house-made, are a natural extension of that food trend. Locally grown produce, farm raised organic meat or poultry, artisan cheeses, or handcrafted beers appeal to consumers, who like to know where their food is coming from. Consumers want a connection with their food, even if it is a simple beer or a side of pickled cabbage. Fermented foods offer a unique twist on classic dishes. Few people would think to tell their friends or coworkers about the awesome pickle spear that came with their burger or slider. But they may be more inclined to tell friends about the exotic mango Kimchi coleslaw that was served on the side. For restaurants, fermented foods offer a lot of benefits. Many are cheap, with low food cost, offering a nice way to upsell classic menu items like burgers, soups, and other pub fare. Fermented foods are considered a healthy option by some, being low in calories, with probiotic benefits. Will fermented foods remain popular? Time will tell. For right now it’s worth a restaurants time to incorporate some simple fermented ingredients on the menu.